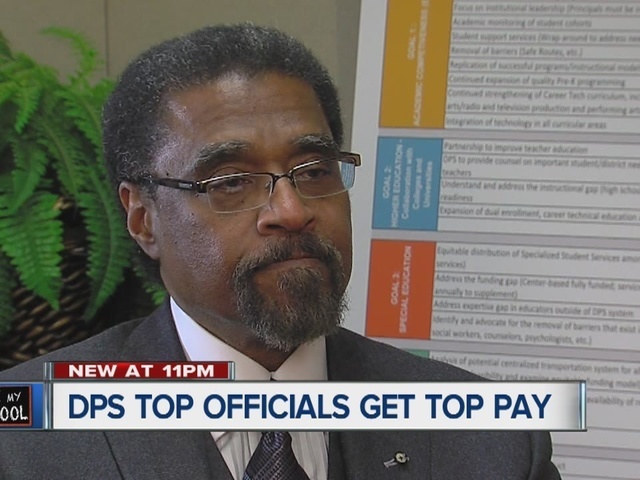 Last year, in his first budget address as emergency manager for the Detroit Public Schools, Darnell Earley hit a familiar note. "Our employees have been very understanding in recognizing where we are," said Earley during the address. For five years now, there's been a 10% wage cut for every employee. "I cry when I get my paycheck," said one teacher that wanted to remain anonymous to avoid punishment for speaking out. One teacher we spoke to showed us a pay stub. After she pays for her health insurance and taxes there is about $400 a week to support a family of four. But while teachers and other employees have sacrificed, and many can barely pay their bills, 7 Action News found top executives are still getting a very sweet deal. We obtained contracts for execs and reviewed salaries at districts across the U.S. We found the big shots at DPS are among the best paid in the entire country. Take, for example, the Executive Director of Communications, Michelle Zdrodowski. On the same day Earley delivered his grim budget speech, she inked a one-year contract for $161,111. Incredibly, that's more than Los Angeles and Chicago, the second and third largest districts in the U.S. pay their P.R. bosses. Even with the 10% pay cut, Zdrodwoski earns more than her counterparts at many larger districts we reviewed. Detroit has also gone Hollywood when it comes to its Chief Procurement Officer. The purchasing boss in Los Angeles makes about $157,000 per year, the same rate DPS signed Medina Noor for. Even with the 10% cut, she's better paid than the bosses in Dallas and Philly, districts more than three-times the size of Detroit. It's a similar story with Steve Wasko, Executive Director for Enrollment. He makes more than the enrollment boss in Chicago - which has 400,000 students - and Philly, which is also far larger. It's a pattern that repeats itself - with executives who oversee food, special education, risk management, and charter schools. All rank at, or near, the top in pay. "When you look at the size of this district, it has around 46,000 students. When you look at where that ranks in the country it is about 90th. But yet you have some of the highest paid top officials in the country. How do you justify that?" WXYZ asked Darnell Earley. "I haven’t seen that first of all, you say that," said Earley. "I haven’t seen your research, so I am not going to try to justify or not justify anything." We offered him our research. He didn't want to review it and comment. While Earley tries to shift blame to other emergency managers, his signature is on the high salary contracts. Plus, there is little sacrifice for top executives when it comes to benefits. "When we look at the benefits packages for the top officials in your administration, they are extremely generous - 25 vacation days, 17 sick days. Add in holidays and they are getting about 50 days off. Why are the benefit packages so generous when it is a financially insolvent district?" we asked. "Well again I don’t know that to be the case. You are presenting your research to me and I am telling you where there are areas we need to adjust we have been doing that," said Earley. But this is not research. These are contracts he signed. If you are wondering what top officials do with all that paid time off, it is possible they have second jobs. Their contracts allow it. As top officials at DPS enjoy some of the most generous contracts in the country, the district is running out of cash. It is set to run out of money needed to operate in April if state lawmakers don't act.